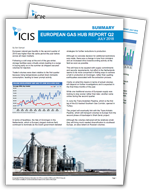 ICIS is the expert provider of pricing and market information across the European natural gas market. 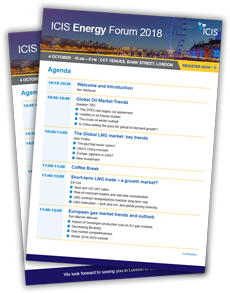 With two decades of expertise in price reporting for Natural Gas, ICIS is one of the most widely traded and referenced prices across the European spot gas market. The ICIS European Spot Gas Markets report provides you with the latest prices, news and expert analysis on the current day’s trading. 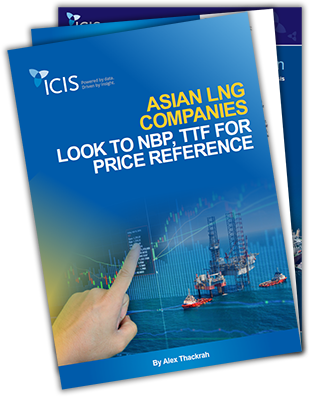 We publish independent price assessments and Heren indices for the British NBP, Dutch TTF, German NCG and GASPOOL, Belgian Zeebrugge and ZTP, French PEG Nord and TRS, Italian PSV, Austrian VTP, Czech VTP, Spanish PVB, Slovak VTP and Turkey. 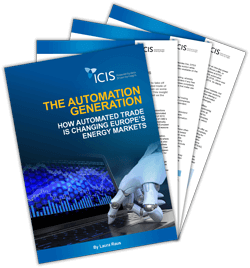 ICIS Technical Analysis is now included as part of the European Spot Gas Markets (ESGM) and European Daily Electricity Markets (EDEM) service. Access latest analysis on gas market developments, trades, price trends and far reaching forward curves. Use ICIS benchmark prices to navigate markets and settle contracts. Traders and procurement managers: Use ICIS independent price benchmarks to embed into contracts and strengthen your positions in price negotiations, and deals. Analysts and Risk Managers: Analyse supply and demand dynamics and support your risk management strategy. Senior level executives and Managing Directors: Access gas market insights to stay on top of the latest developments. Most widely used gas price benchmark provider for Europe. Longest history of proprietary European gas market prices. European natural gas liquidity higher than Q2 2017, across all major markets. The July 2018 issue of the European Gas Hub Report gives you an update on the European landscape, with in-depth coverage of prices, liquidity data, trade volumes and developments across 22 gas hubs. Global LNG imports increased by 7% year-on-year in the second quarter (Q2) of 2018, with continued strong growth in demand from China. China saw a 40% year-on-year increase in its Q2 imports, slowing a little from the annual growth rate seen over the winter, but still providing a major boost to the global consumption. 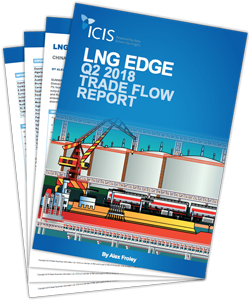 Download the LNG Edge: Q2 2018 Trade Flow Report now. Global LNG market supply has been tighter than expected, primarily due to high demand from Asia, as well as strong US deliveries to markets closer to the Americas. ICIS deputy editor of LNG Europe, Alex Thackrah, discusses why Asian companies are looking to the Dutch TTF and the UK’s NBP for cargoes with flexible destinations. Price volatility is a good indicator of market dynamics for any investor willing to take exposure in energy commodities, especially as prices are characterised by unpredictable shocks and fast-changing drivers. 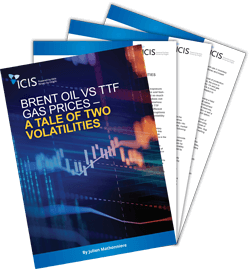 In this market insight, ICIS takes a look at Brent oil and TTF gas prices to understand what their changes reflect and why they seem to be tracking different patterns.